How is Yoga Therapy different from general yoga? Yoga Therapy is different from general yoga in that the practice is adapted to your specific needs and is tailored to create specific effects based on your goals. You take an active role in your own health, healing or management of your condition. Why Consider Individualized Yoga Therapy? Mary Hilliker, RDN, E-RYT 500, C-IAYT, Certified Viniyoga Teacher & Yoga Therapist working with a client. A Yoga Therapist is specially trained to work with individuals and groups to use therapeutic applications of the tools of yoga. A certified Yoga Therapist has training beyond a general yoga teacher training (minimum of 800 hours of training beyond a 200 hr. teacher training certification). IAYT-C (International Association of Yoga Therapists-Certified) demonstrates a level of training and experience consistent with international educational standards for Yoga Therapists. A private session usually involves an intake and assessment to learn more about you and your goals. An initial practice is designed and taught. A yoga therapy practice for home (or work!) may be short and “do-able” for your life. Follow-up sessions focus on continuing to refine the practice or provide additional practices. Sessions are typically 1 hour long but may vary with your needs and interests. Discounts available as needed for those who are currently off work due to health issues. Mary Hilliker, RDN, E-RYT 500, C-IAYT, Certified Viniyoga Teacher & Yoga Therapist sees clients for a variety of conditions including structural, physiological and mental/emotional health from May through October. 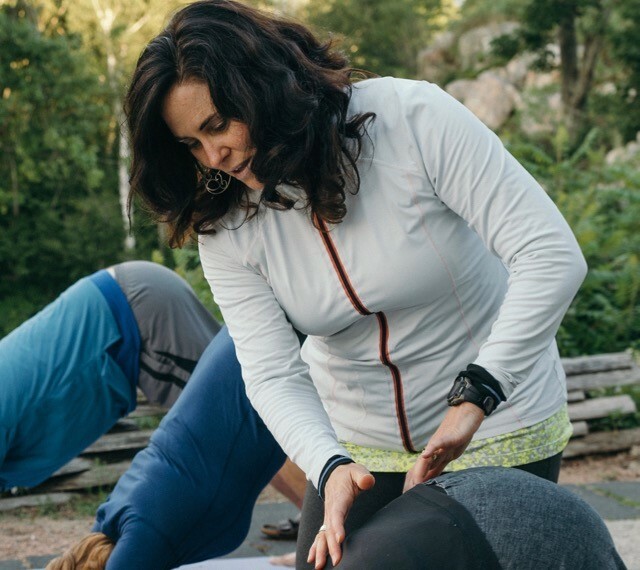 Heather Van Dalfsen, MEd, E-RYT 500, C-IAYT, Certified Viniyoga Teacher & Yoga Therapist sees clients for a variety of conditions including structural, physiological and mental/emotional health. “In our private sessions, Heather’s guidance, knowledge and willingness to problem solve has blessed me with improved comprehension of my body’s abilities and limitations. Heather addresses so much more than the postures and modifications. Her words inspire my mind and my spirit and she gently reminds me that everything is a practice! ” -C.